Shannon Chamber is delighted to welcome Paul McGinley to address members at the President’s Lunch in Dromoland Castle Hotel. Having spent 5 years at college and University, prior to his career in golf, Paul has a degree in International Business and a diploma in Marketing. He has been a European Tour player now for over 25 years. Despite winning several tournaments and being a former top 15 ranked player in the world he is best known for his performances in team competitions. 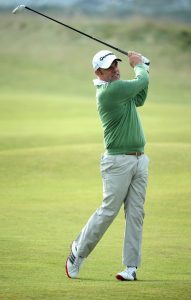 As well as winning the World Cup for Ireland with Padraig Harrington in 1997 he has represented Europe on 21 occasions as a player or coach winning an astonishing 20 times, most memorably in 2014 where he led Europe to a comprehensive victory over America at Gleneagles in Scotland. This led to many awards including being voted Coach of the year at the BBC Sports Personality of the Year in 2014 and being made an Executive Fellow at London Business School, the first sportsman ever awarded this honour. He currently still plays a limited golfing schedule and spends most of his time representing his many business partners as well as talking and writing on leadership at London Business School. This is a great opportunity to entertain clients and colleagues at corporate tables. Company branded lunch table of 8, 10 or 12 can be reserved. Individual places are also available. Events Cancellation Policy: Cancellations will be accepted up to 72hrs before each event. Events which are cancelled within 72 hours of scheduled date shall incur a cancellation fee equal to 50% of the agreed cost. Registrants who fail to attend the event will be charged 100% of the full fee. This policy applies to all events. Please quote Purchase Order number if required on invoice.